MICA's M.F.A. in Studio Art Summer Low-Residency (MFAST) program is designed for experienced artists who want to pursue graduate study without disrupting their ongoing careers. The emphasis of the MFAST is in integrating practice with theory, where students are encouraged to be independent thinkers and researchers who may focus on one specific medium or work across various media. MFAST students complete their graduate studies over three years plus one summer. Each year, students come to MICA for an intensive six-week summer residency combined with independent work during the academic year and a return to campus for a short winter session. During the time that students are not on campus, they keep in touch with their dedicated faculty mentor through distance learning tools. Intensity and length of the program help to create a strong community of peers and a network of visiting artists, critics, and alumni that truly influence the students thinking and practice. Areas of concentration include the full range of contemporary art practices; students may focus on one specific medium or work across various media. Although the program promotes interdisciplinary approaches to art production students are encouraged to work in ways most appropriate to their individual research. Individual studios and a broad array of academic resources and facilities are provided for all the students while they are in residence during the summer session. Candidates must develop their own studio facilities for use during the academic year. Exhibition space is provided for group shows and individual thesis shows during the summer. Each candidate is assigned a faculty mentor based on the work submitted for admission. These faculty mentors the student for the duration of the program. More feedback comes from a visiting critic who also meets with the students weekly during the summer. Finally, there is a different visiting artist or critic each week during the summer session as well as during the winter critique. This low-residency program is intended for a broad range of experienced artists, teachers, and other art professionals who wish to expand their understanding of contemporary art through an engagement with extensive studio practice while developing a conceptual framework for their work. Sarabel Santos Negrón is a multidisciplinary artist, educator and museum professional. Her work focuses on the experience and memory of the nature and landscape of Puerto Rico and the Caribbean with a special interest in its expansive organic form and structure. 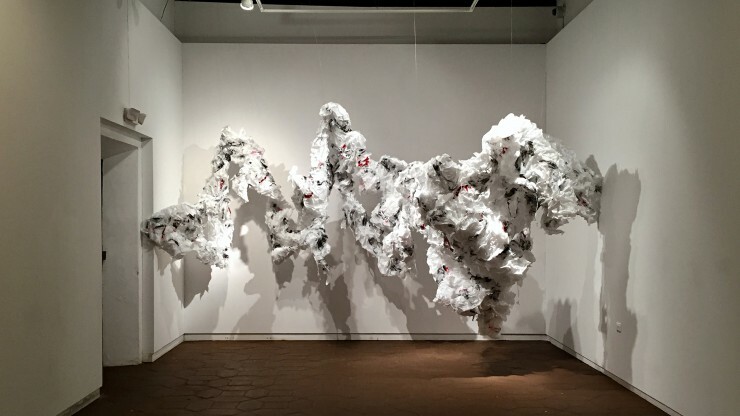 She uses drawing, painting and mixed media together with industrially produced and everyday materials such as paper, plastic, wire, and wood, among others. She is also director of the Museo de Arte de Bayamón (MAB) in Puerto Rico.